Biological systems are not static. Thus they can be engineered to account for changing environmental conditions, as we've seen through our examination of two component regulatory systems. In addition, they can be engineered to account for changes that occur as the cells replicate and divide over time. Indeed, evolution of biological systems away from an original specification can be viewed as a curse (it's not like computer scientists have to worry that their software programs change functions when they relaunch them!) or a blessing (evolution can find a solution we didn't ever dream of). Here we'll take the rosy view and try to harness genetic variability to improve the bacterial photography system. In particular we'll screen a library of changes in the Cph8 gene to find ones that either increase the kinasing activity of the sensor when the cells are growing in the dark OR increase the phosphatase activity of the sensor when the cells are growing in the light. The first class of mutants (we'll call them K+) should make the "dark" color of the photographs more dark by increasing the amount of phosphorylated OmpR that stimulates LacZ transcription. The second class of mutants (we'll call these P+) should make the "light" color of the photographs lighter by decreasing the cell's levels of phosphorylated OmpR, thereby decreasing LacZ transcription. To complement the genetic approach for solving biological engineering puzzles, we'll also consider two other approaches in synthetic biology. The first is a Registry of Standard Biological Parts, essentially a community resource that has some ready-made and useful genetic elements that can be assembled into synthetic biological devices systems. The second approach is to model biological systems, in this case we'll recapitulate the genetic structure of the bacterial photography system using electronic components, making explicit some of the benefits and limitations of such an approach. The details for how the libraries were constructed and what kinds of changes are reasonable to expect will be considered in the next lab session. For today, you will transform a pool of DNA with degeneracies in the positions that affect the kinasing or phosphatasing activity of EnvZ. The recipient bacterial strain is identical to the bacterial photography system except that it does not harbor a plasmid encoding the light-sensing fusion protein Cph8. It does encode the OmpR-regulated LacZ gene as well as the phycobillins from a plasmid. To carry out the transformation you will try your hand at a different technique for getting DNA into cells, namely electroporation. This method involves exposing a small but dense volume of cells to a pulse of current. 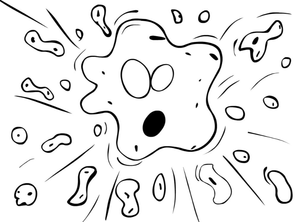 The pulse momentarily flips the lipid bilayer, opening small spaces for the DNA to pass into the cells. As you can imagine, the cells aren't fond of such treatment and the single most important step to help them recover is to quickly add media to the cells once they've been electroporated. The process is also very sensitive to salts in the DNA, and if you pipet too much DNA on to the cells, the extra salt may cause an electrical "arc," (you'll know this has happened from the flash of light and the "pop" you'll hear) frying the cells dead. If this happens, please get another aliquot of cells from the faculty and try the electroporation again, with less DNA. Pipet 2 ul of the library DNA that is being held in an icebucket on the teacher's bench into your aliquot of cells. Be sure to decide and then note if you are screening the K+ or the P+ library. Hold the pulse button until you hear a beep. Transfer the cells and the media back to an eppendorf tube and place the tubes on the nutator in the 37° incubator for 1 hour. During this incubation you can work on Parts 2 and 3 of today's protocols. Spread 10 ul + 50 ul sterile water on one LB+Cam+Amp petri dishes. Plate 50 ul of the electroporation mix on another LB+Cam+Amp petri dish. One of these two dilutions should have single, well-isolated colonies to examine next time. Incubate the plates at 37° in the light or the dark (depending on the mutant you're looking for) until next time. To familiarize yourself with the Registry, you'll design a light-generating device for E. coli. This device will consist of at least 3 parts from the Registry: a light-generating ORF, a promoter and a ribosome binding site (RBS). Try using the "catalog of parts and devices" (the leftmost icon here) to search for a part you'd like to use. Start your search in the "protein coding parts" and then identify one of interest to you and your lab partner. What is the relative strength of this RBS? In plain english, what behavior do you expect for your three part construct? In this section, we'll explore the issue of signal strength in the context of an electrical circuit. As you work through this exercise, consider how the lessons learned from experimenting with an electronic circuit would map to the engineering of biological systems. Many thanks to Tom Knight, Reshma Shetty and Barry Canton for this exercise, as well as Steve Wasserman for his troubleshooting and helpful improvements. As you know, the bacterial photography system is constructed from two devices. An Input Sensing Device: a device which, in response to dark, produces a signal that's detected by the output generating device. An Output Generating Device: an actuator which takes an input signal from the first device and produces a detectable output. We can construct an analogous system from electrical components. An LED: an actuator that responds to a current input by emitting colored light. 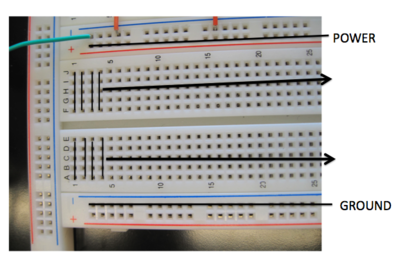 We can thus use these two devices to build a circuit that will operate similarly to our bacterial photography system: the photodiode will sense light and generate an electrical signal that will be detected by the LED which produces a color. This system is fairly simple one since it only consists of a few components. In contrast to the bacterial photography system in which the signal is propagated through protein activities, here signals are propagated as either voltage or current. As you can see in the schematic, the circuit contains the following parts. 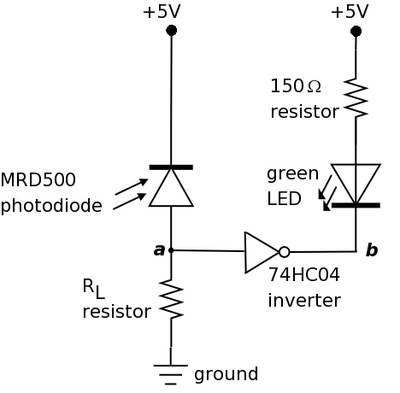 Photodiode: #MRD500: light sensor whose resistance decreases in the presence of light such that more current flows through it. LED: device which responds to a voltage drop across its terminals by emitting green-colored light. Resistor: components which resists current flow by producing a voltage drop across it. Inverter: #MM74HC04: a logic device which inverts its input signal. The purpose of the photodiode is to serve as a light sensor (like Cph8 and the phycobilins) and the LED serves as a readout (like LacZ). The 150Ω resistor is there to ensure that the voltage drop across the LED isn't too high (which can cause the LED to breakdown). There is no direct analog to this part in the bacterial photography system. The inverter provides a convenient way of connecting the photodiode to the LED and mimics the logic in the biological signaling cascade. 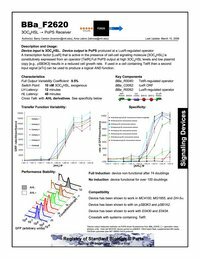 The other resistor RL is there to ensure that the signal between the photodiode and inverter are matched, in much the same way as the opposing kinase/phosphatase activities temper the signal strength in the biological system. When light shines on the photodiode, its resistance is decreased and current flows through it. Thus, point a in the circuit diagram is at high voltage (near +5V) and the input signal to the inverter is high. The low output signal (point b) from the inverter creates a voltage drop across the LED causing it to turn on and emit light. In the absence of light, the photodiode has high resistance such that little current flows. Point a in the diagram is at low voltage (near 0V) and the inverter produces high output at point b. The resulting lack of voltage drop across the LED means that the LED is turned off. Much of this exercise will focus on RL and varying the signal between the photodiode and inverter to affect circuit operation. A general technique that engineers use to understand a system is they look at the simple, extreme cases and try to reason out the behavior of the circuit. We'll try this to familiarize ourselves with the system. Most of this circuit has been implemented for you. Comparison of the photo (below) with the circuit diagram (above) should show that the circuit is wired up as shown in the diagram with the exception of the RL resistor. To begin, you'll examine the two extreme cases for the value of the RL resistor: 0Ω and ∞Ω. Now examine the other extreme case. Connect a wire between ground and the photodiode. Sample connection points are indicated in the circuit photo with circles. Wires tend to have very little resistance so this setup is almost like putting a resistor of 0Ω between the two points. Explain why you observe the behavior you do given that there is almost no resistance between the photodiode and ground. Now that you've explored the two extremes, let's try to actually build a functioning circuit. If you think back to physics, Ohm's law defines the relationship between voltage, current and resistance. You should be able to obtain values for VIL and VIH from the inverter datasheet (also linked above) and values for the light and dark current from the photodiode datasheet. With this calculation, you should see how helpful it is that inverters and photodiodes have been extensively characterized and that their performance is well-documented. Contrast this to parts in the Registry of Standard Biological Parts in which very few parts have any characterization data at all. We have a long way to go! Determine values (with units!) for the four variables from the datasheet and explain from where on the datasheet you retrieved them. Then calculate the bounds on RL to help narrow your search for a resistor or resistors that will lead to a working circuit. These bounds will not be exact because the performance of real components deviates some from the model predicted by the equation. Nonetheless, this calculation should give you a place to start for finding an RL that gives a working circuit. Try to find a resistor or series of resistors (resistors connected end to end) for RL that lead to proper circuit operation: in the light, the LED is on and in the dark, the LED is off. (Notice this is the reverse of the signaling in the bacterial photography system, as we'll consider later). 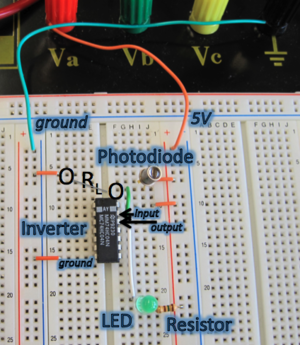 Make sure that one resistor end is connected to the photodiode and the other to ground (as shown by the circles in the circuit photo). You will need to verify that you are wiring up the resistors properly given the layout of connections on the breadboard! Use the resistor color code table to check that you are using resistors of the resistance you want. You don't need to determine the exact range for RL but getting approximate, experimentally-determined limits gives you an idea of how robust the circuit is to RL. 4. (OPTIONAL): You noticed that in fact the behaviour of the electrical circuit we built is opposite that of the bacterial photography system. The LED readout is on when light shines on the photodiode. In contrast, in the bacterial system, the LacZ readout is "on" only for cells in the dark. Propose a redesign of the electrical circuit that will yield the same behavior as the bacterial photography system. This page was last edited on 17 August 2010, at 12:13.